I was contacted by Bruno from Portugal, who has a very nice Opel Manta A series that he has restored. He got a bit carried away sand blasting the rocker cover though and has managed to blast right through some pin holes! As luck would have it, I saved a few rocker covers in earlier years when they were still common place. They are made from pressed steel and were produced in a silk finish in one coat (no primer) enamel paint; typically the front section gets a lot of blasting from the elements and rusts badly. The sides and rear often fare better as these engines tend to breath a lot of oil vapour which covers the sides and back, saving them from corrosion. 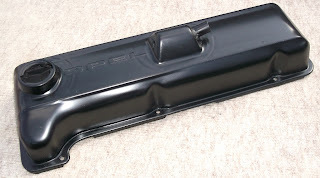 All 3 rocker covers are from the Opel Manta A series, these earlier designs have the brand name Opel embossed in the top section. This design element was removed from later models and the top was plain. I imagine this was because although the engines were all produced at the same plant, some were destined for Opels, whilst others went into Vauxhalls and possibly even Bedford vehicles too. In the 90's it was a popular upgrade to fit this style of early rocker to the later Opel Manta B series right through to the last 1987 models. Previously, here on the Classic Opel Spares Blog, there was even a chrome plated example of this rocker cover available for sale (sorry now sold). The 3 examples listed below have been thoroughly wire brushed, primed in cellulose paint, then over painted with a semi-gloss black finish enamel paint. This job was completed at least 10 years ago, the finish, by now, will be rock hard and should prove to be very durable. Please note this type of finish is not suitable for compounding or cutting back, it has an attractive sheen, similar to the original finish. Opel rocker cover #1, this was originally fitted to my 1973 Opel Manta A series, it is in great unmolested condition and takes the later gasket with 2 tags. Available for £25, including a brand new cork gasket. Opel rocker cover #2, this has come from an earlier vehicle, my best guess would be around 1971-2, someone has welded a pipe to the front to enable a better location for the smaller breather pipe. This will take the earlier gasket with 9 tags. Available for £20, including a brand new cork gasket. Opel rocker cover #3, this has come from a later vehicle, my best guess would be around 1973-5, someone has welded a pipe to the rear to enable a better location for the larger breather pipe. This will take the later gasket with 2 tags. Available for £20, including a brand new cork gasket. One issue that can drive an Opel owner to distraction is oil leaks from the rocker cover, it can be difficult to get a good oil seal from older rocker covers especially if they have been over tightened which causes them to warp, the material is thin an quite malleable, if you over tighten the cover the metal distorts and oil leaks out. The more you over tighten the rocker cover the worse the situation becomes! Discard the original cork rocker cover gasket and buy a new cork rocker cover gasket available here on the Classic Opel Spares Blog for a nominal fee. Thoroughly clean the mating flange of your rocker cover to remove any traces of old cork, oil, grease and dirt. This may require a wire brush on a small power drill, Dremel tool or just plenty of good old "elbow grease". Wipe the mating flange with degreasing fluid on a clean cloth, specialised products are not required, methylated spirits are ideal and cost little. Fit the rocker cover gasket to the rocker cover using a silicon sealer / adhesive, I found that Blue Hylomar worked excellently. Allow the product some time to set. Wipe some clean engine oil to the bottom surface of the rocker cover gasket and re-fit. Tighten the mounting bolts in a criss-cross sequence to spread the load and use the minimum of force. Run the engine and allow it to warm up. Re-tighten the mounting bolts a second time. If the rocker cover shows any signs of bending, go no further. One final thought on the matter is that the original hex head bolts can be awkward to fit with a normal socket set due to the restricted space, especially on the right hand side where water pipes run so close by. I changed the bolts for stainless steel hex socket cap (Allen) headed bolts which were much more easily tightened with a long Allen key, never seized up and looked prettier too. 25/04/12 Rocker cover #3 is now sold, Rocker cover #1 is under offer. 26/04/12 Rocker cover #1 sold and sent, only Rocker cover #2 left.